According to local media,the infant was sleeping under a mosquito net at his home in the eastern state of Odisha on Friday when he was taken by a rhesus macaque, a species with a reddish-pink face common across India. 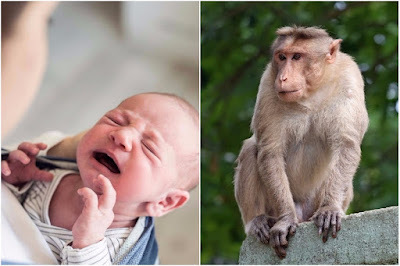 The mother is saying that she saw a monkey take away her child. She raised an alarm but the monkey quickly leaped over the roof and vanished out of sight. Activists say the invasion of the animal’s natural habitats by urban populations has caused the problem. No case was registered as the "family is convinced it's the monkey that killed their child". In March last year, schools were closed in Odisha's Kendrapada district because of frequent monkey attacks.